Top Tips For Transitioning Goals Beyond January | Life, Sport and Diabetes - An everyday look at my life with type 1 diabetes. January is famous for being associated with setting new goals and making New Year's resolutions. But this year you'll have noticed on the blog that rather than writing about goal setting at the start of 2018, I reflected on the previous year and left it at that. The reason for this wasn't that I don't have or set goals, I do. However, the thing about goals is that they are often based on the things we want to achieve or change, and not everything can be achieved or changed in four short weeks. I think that real change needs to be a bit more long term and a lot more sustainable. What I really want to write about on the last day of January, is taking our short term goals forwards into the rest of the year and thinking about some top tips to help achieve that. Long-term fitness goals are important to me this year because I've signed up to two personally huge sporting challenges that I want to achieve. The first is to participate in the Snowdon 500 Challenge in May, in aid of Prostate Cancer Research, which involves climbing Mount Snowdon, the highest mountain in Wales. The second is to run my very first half marathon in July as part of the Guiness World record attempt for the most people with type 1 diabetes to run the distance, before starting Winter training for athletics again in the Autumn. This doesn't have to mean shouting them from the roof tops, but writing them down or letting others know can help make them real. It could also help loved ones get on board and provide additional support to help you hit your goal. Over the years I've learnt that a training session shared is a training session gained. Some really tough workouts like sand dunes or circuits really wouldn't have been possible without training partners. So why not be social with the workout, I think it makes the time go faster. There are also some workout apps available that help you share your workouts on social media so others can support you. Over the years of doing athletics, I've spoken to a lot of people looking to get involved in physical activity, who have diabetes, and who are concerned about what to wear to carry their pump. It doesn't have to be an expensive investment, but I do think it's worth spending some time on finding active wear with pockets to safely carry devices such as pumps and glucose monitors in. As people with diabetes, we're used to recording information on our blood glucose levels and insulin doses. But it can be really helpful to keep track of all this along with physical activities. Not only can it help to show patterns and trends in diabetes and sport, but when you look back over the exercise goals achieved, it can be quite motivating to see how far you've come. 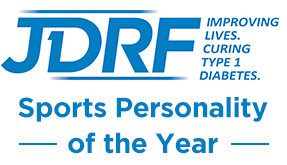 Throughout my sporting career it would have been really easy to compare myself to people without diabetes all the time. But the truth is that everyone is different and my 'journey' to the track was very different to others. When you stop comparing however, it helps you be a bit kinder to yourself by being less judgemental.